Lock in a great price for InterContinental Abu Dhabi – rated 8.5 by recent guests! Restaurant . Their breakfast one if the best in Abudhabi. During my visits to Abu Dhabi hotels , only almost three hotels have awesome breakfast and this one of them. Chamas experience outside was also spectacular. Considering I had a discount coupon as it is too expensive . The bay shore beach club is great, it has a large pool and a kiddy pool with a slide! Breakfast selection was good. Restaurants in the hotel were amazing, in particular Belgian cafe. Amenities was also good although I wished they could try extending the timings of the pool (till 8PM only) since most guests would probably be out during the day and come back at a later time. The staffs were very friendly and polite, everyone had a smile on their face whenever they greet you. Ambience, Staff, Service, the one who help us and answer all of our inquiries Ms. Monika Singh, Breakfast at Selections, amenities and the surprises for us, a complimentary cake. Absolutely amazing...the breakfast and dinner buffet at Selections restaurant were incredible. We originally had paid for breakfast with our two day booking, and when we checked in the receptionist offered we can get dinner included for 100 AED each per day - we were unsure at first because we are on a budget, but SO GLAD we did it. Probably the best hotel I've ever stayed at. We were there around Christmas and the hotel is so festive and left a stocking on our door. Spectacular layout at the buffet on Christmas eve and amazingly decorated desserts. Decent hotel, a little dated but with a great outdoor dining terrace. The staff were very friendly espically mr Raaoof and mr Ahmed at the reception and all the crew there were very good. The rooms were very classy and the resort was amazing. I loved the whole experience really,it was a trip of sheer indulgence. Nice hotel with beach/pool and sports facilities; quite many dine in options from all major kitchens around the world. InterContinental Abu Dhabi This rating is a reflection of how the property compares to the industry standard when it comes to price, facilities and services available. It's based on a self-evaluation by the property. Use this rating to help choose your stay! Located at the heart of the capital, InterContinental Abu Dhabi is located on the beach and a 10-minute drive from bustling downtown. It is 20 minutes by car from Abu Dhabi International Exhibition Center. InterContinental Abu Dhabi is home to some of the city's best dining experiences. Enjoy succulent Brazilian cuts of meat at Chamas Churrascaria, authentic Lebanese specialties at Byblos Sur Mer, Italian family fare at Circo, old-world favorites at Belgian Cafe, pan-Asian flavors at Cho Gao Marina Walk and fresh seafood with a Thai twist at the award-winning Fishmarket. Enjoy a variety of wines, cocktails and coffee at the Piano Lounge. The all-day dining restaurant Selections serves breakfast, lunch and dinner with the perfect view of beach and marina from almost every table. When would you like to stay at InterContinental Abu Dhabi? Elegant & spacious club rooms overlooking the city skyline featuring a work area with feel of comfort and indulgence. Access to club lounge with complimentary breakfast and cocktail hours. Club benefits is not granted for upgrade. Savor panoramic view of Abu Dhabi skyline by indulging inthe spacious and sophisticated 41sqm deluxe rooms. 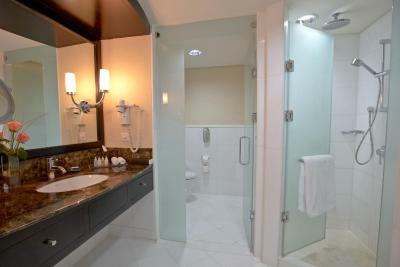 Relax in a marble bathroom with separate soaking tub and shower area. Free WiFi with diverse media solutions ideal for business and leisure travelers. One extra bed can be placed in room. Elegant and spacious club rooms overlooking the Arabian gulf featuring a work area with feel of comfort and indulgence. Access to club lounge with free breakfast and cocktail hours. Alternate venue offered for child below 12yrs. Club benefits is not granted for upgrades. Savor panoramic view of Abu Dhabi skyline by indulging in the 75sqm deluxe city view suites with separate bedroom and living area inclusive of access to club lounge with complimentary breakfast and cocktail hour. Club benefits do not apply with upgrade. 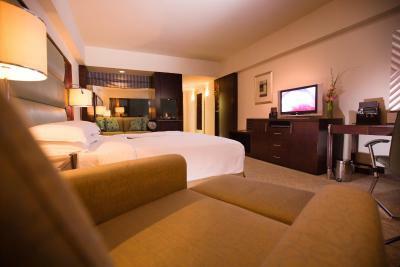 Elegant and spacious club rooms overlooking the city skyline featuring a work area with feel of comfort and indulgence. Access to club lounge with free breakfast and cocktail hours. Alternate venue offered for child below 12yrs. Club benefits is not granted for upgrade. Savor panoramic view of Abu Dhabi skyline by indulging in the spacious and sophisticated 41sqm deluxe rooms. Relax in a marble bathroom with separate soaking tub and shower area. Free WiFi with diverse media solutions ideal for business and leisure travelers. Located on the higher floors from 3rd to the 12th floor, the room has a comfortable spacious work area with the view of the Arabian gulf or city skyline. When you arrive at the hotel the hotel will do their best to meet your room and bed type preferences. These are subject to availability and cannot be guaranteed. Combining luxury in style 75 sqm deluxe sea view suites offer spectacular views of the Arabian gulf with separate bedroom and living area inclusive of access to club lounge with complimentary breakfast and cocktail hour. Club benefits do not apply for upgrades. Enjoy panoramic views of the Arabian gulf and Abu Dhabi city skyline in the 91 sqm one-bedroom Emirates suite inclusive of access to club lounge with complimentary breakfast & cocktails hours. Alternate venue offered for kids below 12yrs. Club benefits is not granted for upgrades. The hotel is a culinary haven with themed restaurants. Cho Gao Marina Walk, Brazilian Churrascaria, Fishmarket, Italian Circo, Belgian Beer Cafe and the Bayshore Beach Club offering three swimming pools, two of which are dedicated for children. House Rules InterContinental Abu Dhabi takes special requests – add in the next step! InterContinental Abu Dhabi accepts these cards and reserves the right to temporarily hold an amount prior to arrival. Construction in front of the hotel (sea view) seems temporary issue, the bed and towels were nice and clean but there were smudges on the doors and mirrors (need to pay attention to the cleanliness), would like to see more environmentally conscious actions in the hotel, rooms should be refurbished, cable was fixed with a tape, hotel restaurants are very expensive with mediocre food. Pools were really good and temperature controlled, staff very helpful and friendly, very good location walking distance to the Emirates Palace, Corniche or Founder's Monument. Rooms are specious with nice view. Excellent breakfast. Wifi was good, private parking. Just only TV It is small comparing to room size. Channels were mostly not available specially OSN were failure connection. There is no discount for the residents to dine in in Chamas or Byblos. Have to get a discount codes from outside while as residents should have it without looking for it. Comfy beds, good showers if a little old now. Very worn down, not clean, many things not working well. Breakfast was not so good. Too many tourists from CIS, on all inclusive packages. Breakfast was very good with many options. The building is old. Beach is not the one you would get back to, view from it is not relaxing. Wifi was a disaster, speed is so slow and connection always unstable.